Grandma knew better than to show her ankles on the street, but today’s young Jezebels think nothing of flaunting bare knees, backs, and arms in the public square. In a pair of exclusives to the Los Angeles Times, reporters covered the scourge of flapper fashions. In woodsy Ellenville, New York, Chief of Police Ross bluntly described the problem facing his village. "They really don’t wear enough clothes, the girls who come here for the summer," he said today. Not that the town fathers objected to "short dresses and low-necked gowns, or even bathing suits" as long as the wearer appeared "to have at least a vague interest in swimming." Herein lay the problem. "Somehow a fad got started . . .," Chief Ross explained, "and now half of the girls are running around the streets dressed only in swimming trunks and blouses." On the streets, mind you, where children and the good town fathers might see them—and where no swimming ever took place. "Others wear some little jumpers that look like men’s track pants, sweaters and sandals," the law man continued, perhaps evidencing a more than professional interest in the topic. But woe to these sun-worshippers and their fans: Mayor Wells plans to call a meeting of city trustees next week to pass an ordinance compelling "the girls to wear more clothes." Meanwhile, in Milwaukee, Wisconsin, Dr. Hoye E. Dearholt today announced that "[s]cantiness in women’s dress is primarily responsible" for a rise in "the white plague" of tuberculosis among young women. 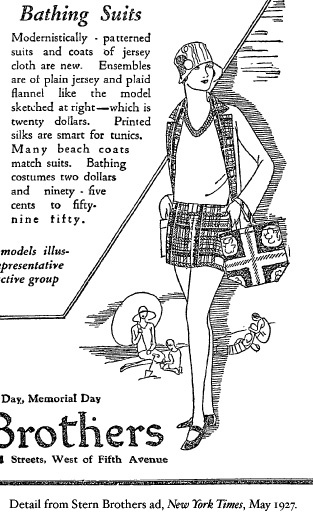 According to Dr. Dearholt (chief of staff at the Wisconsin Tuberculosis Association), girls and young women between the ages of 15 and 25 who diet to attain fashionably boyish figures and then dress in revealing clothing lower their resistance and set themselves up as easy prey for the disease. "There is a point in the race for scanty clothing at which a girl must stop, lest the body be chilled too much and weakened," the doctor noted before calling for "dress reform." Fashions "somewhere between the petticoat days of two decades ago and the extreme flimsiness of the present day dress would be ideal," he noted. One only hopes Mayor Wells, Chief Ross, and Dr. Dearholt didn’t live to see the advent of the miniskirt and monokini in the 1960s. That’s actually Sue Carol, 5’3", Fox Films player and daughter of late "Chicago capitalist" Samuel M. Lederer (and later, the agent who discovered, married and buried Alan Ladd), modeling the reversible panne velvet-lined rattlesnakeskin coat her mama sent from home. 64 snakes, averaging more than four feet each, went into the garment, which some are calling Eve’s revenge. Miss Carol is currently appearing in Slaves of Beauty, a satire of the beauty parlor scene featuring some wacky business with a magical clay that leaves the skin under it lookin twenty years younger. Wonder if it works on rattlesnakes? The world is changing, sometimes for better, others for worse. In Chicago, the Western State Bank has responded to the concerns of its late night poker playing constituency by installing an ingenious device in the wall of their newest branch. This gadget permits an account holder to relieve himself of his attractive burden by way of a secure "cash chute," a heavily armored tube alarmed with electrical and radio wave protection, thus protecting his winnings from street thug or wife alike. But in the nation’s capitol, the baggage handlers of the Union (Station) Transfer Company are crying poverty, blaming the flimsiness of fashionable ladies garb for the reduction in trunks being shipped ahead. Why, travelers simply stuff their wardrobes into suitcases and pack them in their cars! Accordingly, UTC is requesting permission to apply a rate increase to those sad saps who didn’t get the suitcase memo… but while they can gouge their customers, they can’t hold back the sands of time.